Saturday afternoon football games have been a ritual for the close knit community of Winchester, Massachusetts which was the Allyn Family's lovely hometown during my childhood years. As there were Allyn family members who were on the Winchester High School Football Team; we went to almost every home football game at the all outdoor (not covered) Manchester Field. Yes, we were often in the rain! Sometime during the 1968 season, we had one game that was on a very rainy day, perhaps one of the heavist rains that we experienced during our family's support of the Winchester High School Football Team. During the game, I saw this lone man standing near the visitor's goalpost during the last half of the game. What was very unusual was that he appears to be totaly enclosed in clear plastic. Unfortunately, our family was seated near the Winchester team's goal post and I could not figure out how to tell my parents and siblings that I want to go clear to the other end of the field to look closely at this man. Espcially when both teams were very close to being tied and the rivalry was very strong! I finally told my mom and dad that I needed to go to the bathroom and then I was able to pass next to the man closely. My inital reaction was correct. I also also a bit scared. Here we were at a high school football game (which are very much family affairs in this community) and this man appeared to me to be setting himself up for suffocation in clear plastic! Moreover, I also noticed that he appeared to have no interest in the game. If he was a parent, he would have been cheering on his childrens' team like everyone else. Instead, he appeared to be in a dreamy state, as if transfixed by something far away from Manchester field and this game. My life, as well as my family's lives were very active in Winchester's tight and intimate communities. Looking carefully at the man as I came closer to him, I desparately searched through the dark catacombs of my brain to find any resemblance of the man in my own many communities; McCall Junior High School; Lincoln School; church; and all of my own extended family and friends. Nothing came out of the wisps of fog in my mind! Much as I alsways had a fascination with clear plastic and love to let my beauty shine through it, I get very scared of suffocation. I stood there, both being scared and trying to figure out whether or not I should suggest to him to cut at least a breathing hole. Noticing my presence, he discretly beckoned me over and lifted as portion of his raincoat as if to invite me inside. Instantly, I was creeped out. I hastily said 'excuse me' and then walked back to where my family was seated. Much as I love to see people dressed in clear plastic, this guy creeped me out and I was scared that he would suffocate! And I had noticed this same man during several other rainy day football games in Winchester thereafter. He always stood quietly near the south end goalpost, not cheering (and not booing) anyone. If it was clear, he would wear a suit. 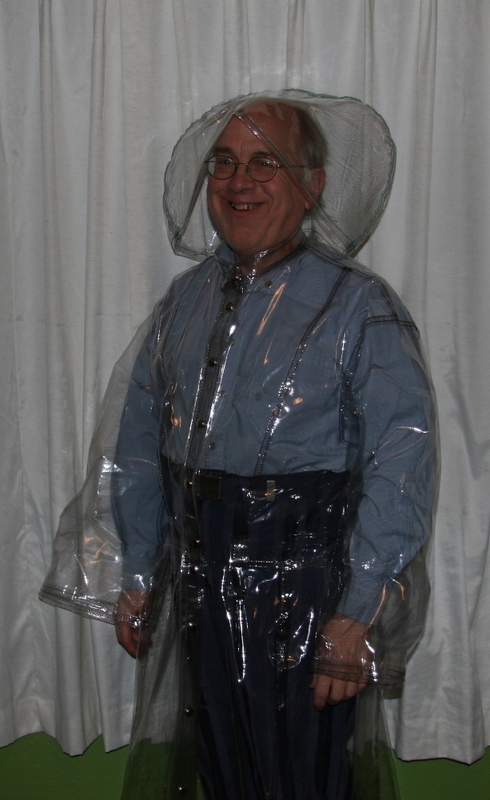 If it was raining, he would wrap himself in clear plastic. It almost always, if he and I make eye contact, he would beckon me to come over to be close to him. I never had. It was not until our family moved to Marion, Massachusetts and while I attended games at Tabor Academy that I had stopped seeing him. The photograph here is a protest against what the man did. As you can see, I am very well protected from the rain, but most importantly, the front of the large hood is very much open and there is nothing in front of my head! If I were that man, I would have worn this outfit instead of the one he wore and I would not have freaked out the young Mark Allyn at Manchester Field in Winchester, Massachusetts! If you were that man in Winchester, may I please ask you to be more carefull. Must as I love to let my beauty shine in the rain, I never let anything come any where near covering my face!